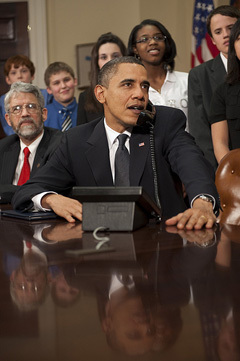 Joined by Congressional leaders and school children, President Obama phoned the crew of the shuttle Endeavour and the International Space Station Wednesday afternoon. "We just wanted to let you know that the amazing work that's being done on the International Space Station, not only by our American astronauts, but also our colleagues from Japan and Russia, is just a testimony to human ingenuity, a testimony to extraordinary skill and courage that you guys bring to bear, and is also a testimony to why continued space exploration is so important," Obama told the 11-person crew. "It's part of the reason why my commitment to NASA is unwavering." Endeavour is in the final days of its mission to deliver and outfit the Tranquility module, the new home of an array of bulky exercise equipment and life support racks. The astronauts also opened the seven-window cupola for business. Described as a bay window on the world, the cupola will offer breathtaking views of Earth and a key vantage point for robot arm activities outside the complex. "I just wanted to let you guys know how proud we are of all of you," Obama said. "I had a chance to take a look at what the Tranquility module is doing. Everybody here back home is excited about this bay [window] on the world that you guys are opening up." The phone call to space was the first time the president has spoken about NASA since the White House budget released its request for fiscal year 2011, which begins in October. The Obama administration revealed its plans Feb. 1, which include scrapping the next-generation Constellation progam taking aim on the moon. In its place, the president foresees NASA extending its work on the space station, starting an aggressive space technology research and development progam, and turning over future human space transportation to private vendors after the shuttle fleet is retired in late 2010. The budget defers expeditions beyond low Earth orbit and offers no timetable for deep space exploration or a new heavy-lift rocket, although senior agency and Obama administration officials insist NASA will soon be tasked with studying key technologies for such projects. President Obama said he was committed to future human space exploration, but he did not discuss the cancellation of the Constellation program or the private sector's role in human spaceflight, two of the most significant and controversial planks of the new space policy. 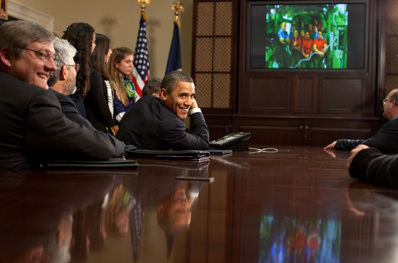 Instead, President Obama asked the astronauts about research aboard the orbiting laboratory and touted the value of developing "transformational" technologies to revolutionize space travel. "Long-duration living and working in space is what the space station is all about, to do the research and the science necessary to take us beyond Earth orbit," said Jeffrey Williams, commander of the space station's Expedition 22 crew. "That was the ultimate purpose of the space station, and the arrival of this [Tranquility] module will enable us to do that." Space station science officer Timothy Creamer also explained experiments being conducted on the complex, including cancer research and materials investigations. "Some of the things that you talked about are in line with where we want to see NASA going increasingly," Obama responded. "What are those transformational technologies that would allow us to potentially see space travel of longer durations? If we want to get to Mars...what kinds of technologies are going to be necessary in order for us to make sure that folks can get there in one piece and get back in one piece," Obama said. "And the kinds of fuels that we use and the technologies we use are going to facilitate something that is actually feasible. We're very excited about the possibilities of putting more research dollars into some of these transformational technologies." The House Committee on Science and Technology will hold the first major hearing on the 2011 budget request next Thursday. NASA Administrator Charles Bolden will be the witness.